You can cut or copy an audio region or region segment in the Audio Editor and paste the copy at a different time position. Select the region, then choose Edit > Cut (or press Delete). 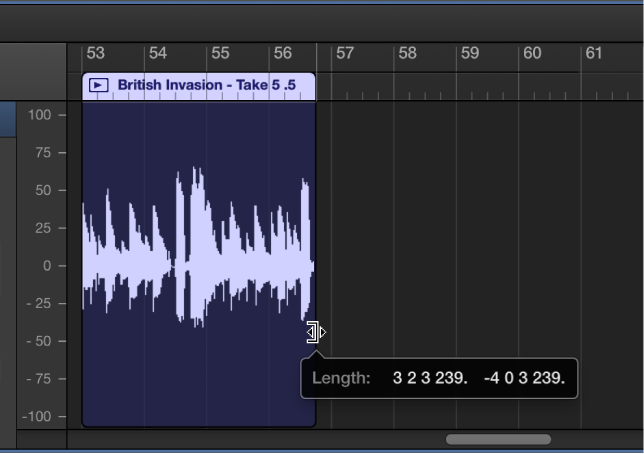 When you Option-drag an audio region so that it overlaps another region, the overlapped part of the region is cut. Select the region, then choose Edit > Copy. Place the playhead at the point where you want to paste the region, then choose Edit > Paste. When you move an audio region so that it overlaps another region, the overlapped part of the region is cut. Place the pointer over the lower half of the region. The pointer changes to a Marquee pointer. Drag the Marquee pointer over the part of the region you want to split. The part of the region outlined by the Marquee pointer is split. You can press Delete to delete it, or move the pointer over the upper half of the region, then drag the split part to another position. Place the pointer over the lower-left or lower-right edge of the region. The pointer changes to a Trim pointer. Drag the pointer over the part you want to trim. As you drag, the help tag shows the region length and the amount by which it’s trimmed.